A commission studying what to do with the most prominent Confederate monuments in Richmond, Virginia, recommends removing one honoring Confederate President Jefferson Davis. RICHMOND, Va. (AP) — As the one-time capital of the Confederacy wrestles with its Civil War heritage, a commission in Richmond recommended Monday removing a statue of Confederate President Jefferson Davis but leaving in place four others, including a soaring tribute to Gen. Robert E. Lee. The panel of historians, academics, local officials and others spent nearly a year studying the issue and taking input from a sometimes-angry public before unveiling the proposals Monday in a more than 100-page report. 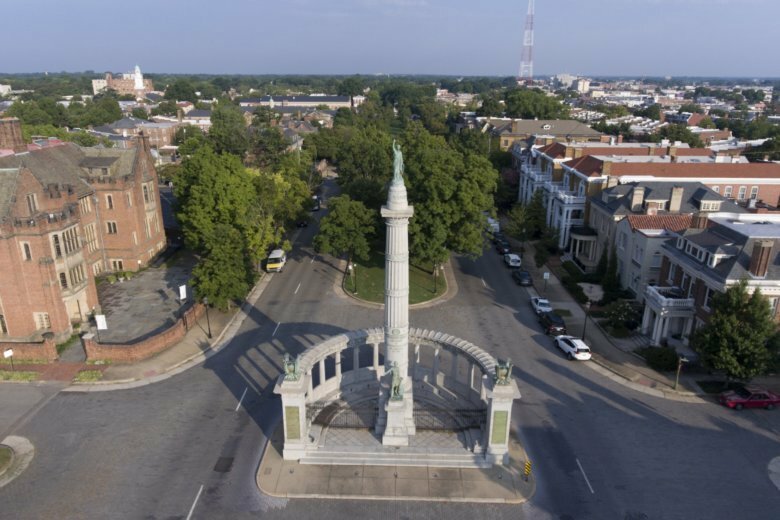 The recommended changes would re-shape one of the nation’s largest displays of Confederate symbolism along Richmond’s famed Monument Avenue and in some ways re-envision how the city presents its history in the public square. In addition to removing the Davis statue, the commission advised adding historical context to the statues and erecting new monuments that would reflect a “more inclusive” story of the city’s history. “In the course of the work, it became abundantly clear the majority of the public acknowledges Monument Avenue cannot and should not remain exactly as it is. Change is needed and desired,” said the report, which is not binding. The recommendations mark the latest development in the national soul-searching over what to do with symbols of the Confederacy. A 2015 mass shooting at a black church in Charleston, South Carolina, and a 2017 white nationalist rally in Charlottesville have heightened the debate over whether such symbols are historical artifacts that should remain untouched or relics that elevate a racist past. “Nowhere in the United States is a frank and constructive dialogue more necessary or fraught with potential controversy than here in Virginia, home to two Confederate capitals and 136 monuments to the Confederate States of America,” the report said. While Richmond has plenty of other Confederate symbols, the commission’s mandate was limited to the five giant Confederate statues that dot Monument Avenue, a prestigious residential street lined with mansions and divided by a grassy median. Richmond City Attorney Allen Jackson has warned that because the Lee monument and surrounding circle belong to the state, the city would need permission to “take action” on that statue. He also wrote in a legal opinion issued to the commission that any effort to remove a monument would likely run afoul of a state law that prohibits local governments or others from “disturbing or interfering with” memorials to war veterans. The statute, which the Republican-controlled General Assembly has shown no interest in amending, is at the center of a lawsuit currently playing out in Charlottesville over that city’s effort to remove two Confederate statues. The commission noted that obstacle, saying that “pending litigation or changes in state law,” the Davis statue should go. It “is the most unabashedly Lost Cause in its design and sentiment,” the report said, referring to an interpretation of the war that historians say romanticizes the South and de-emphasizes the role of slavery. An inscription on the Davis monument, for instance, “styles the Confederate president as a ‘Defender of the Rights of States,’ deflecting the question of slavery,” the report noted. It also emphasized that Davis, who was born in Kentucky, is the only non-Virginian on Monument Avenue. The panel’s recommendations drew criticism from some who said they went too far and from others who said they didn’t go far enough. But B. Frank Earnest, heritage defense coordinator for the Virginia Division of the Sons of Confederate Veterans, said even the proposal to add contextual signs was too much. “You wouldn’t want me to put a sign in your front lawn that says, ‘Nasty people live in the house behind this sign,'” Earnest said. In addition to Lee and Davis, Monument Avenue is currently home to statues honoring J.E.B. Stuart, Thomas “Stonewall” Jackson and Confederate Naval commander and oceanographer Matthew Fontaine Maury. A statue of black tennis hero Arthur Ashe, a Richmond native, was added to Monument Avenue in 1996, provoking a nationally publicized and racially charged dispute. One of the panel’s suggestions was to commission a monument dedicated to soldiers of the United States Colored Troops, regiments of mostly formerly enslaved men who fought for the Union. “The juxtaposition to the Confederate Statues could be a powerful statement,” the report said.